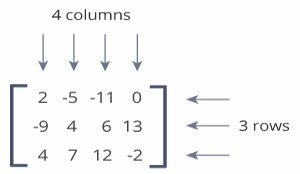 In this article, we will learn about Python matrices using nested lists, and NumPy package. How to create a NumPy array? This matrix is a 3x4 (pronounced "three by four") matrix because it has 3 rows and 4 columns. We can treat this list of a list as a matrix having 2 rows and 3 columns. Be sure to learn about Python lists before proceed this article. Let's see how to work with a nested list. Here are few more examples related to Python matrices using nested lists. Using nested lists as a matrix works for simple computational tasks, however, there is a better way of working with matrices in Python using NumPy package. Visit: How to install NumPy? If you are on Windows, download and install anaconda distribution of Python. It comes with NumPy and other several packages related to data science and machine learning. Once NumPy is installed, you can import and use it. As you can see, NumPy's array class is called ndarray. There are several ways to create NumPy arrays. Here, we have specified dtype to 32 bits (4 bytes). Hence, this array can take values from -2-31 to 2-31-1. Learn more about other ways of creating a NumPy array. Above, we gave you 3 examples: addition of two matrices, multiplication of two matrices and transpose of a matrix. We used nested lists before to write those programs. Let's see how we can do the same task using NumPy array. We use + operator to add corresponding elements of two NumPy matrices. To multiply two matrices, we use dot() method. Learn more about how numpy.dot works. Note: * is used for array multiplication (multiplication of corresponding elements of two arrays) not matrix multiplication. We use numpy.transpose to compute transpose of a matrix. As you can see, NumPy made our task much easier. Similar like lists, we can access matrix elements using index. Let's start with a one-dimensional NumPy array. Now, let's see how we can access elements of a two-dimensional array (which is basically a matrix). If you don't know how this above code works, read slicing of a matrix section of this article. Slicing of a one-dimensional NumPy array is similar to a list. If you don't know how slicing for a list works, visit Understanding Python's slice notation. Now, let's see how we can slice a matrix. As you can see, using NumPy (instead of nested lists) makes it a lot easier to work with matrices, and we haven't even scratched the basics. We suggest you to explore NumPy package in detail especially if you trying to use Python for data science/analytics.